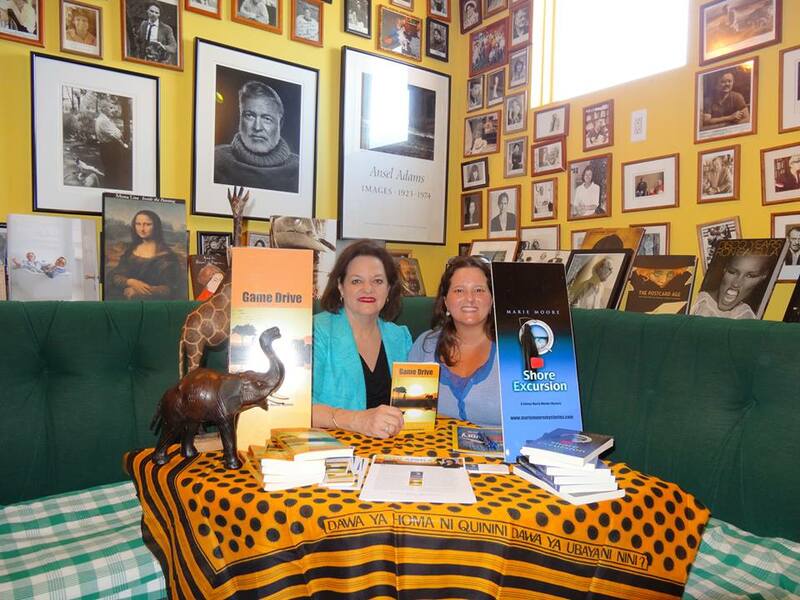 A few weeks ago, I had the pleasure of meeting Marie Moore, author Game Drive and Shore Excursion, at Lemuria Books in Jackson, MS. Marie was fantastic, answered some questions and made everyone at the signing feel comfortable. Two young people, Teresa and Matt, had come to Lemuria on their way back to New Orleans- stopped in for a New York Times, saw the book signing in progress and decided to stick around and grab a book to read instead. Others were more local folks, people who had read Marie’s books, but wanted to get them signed. Marie says that she generally writes between 4am-8am and writes some in her library at one of her houses. Her #literarycrush is Mr.Rochester from Jane Eyre. And while she is working on her books, she does not read- but she is looking forward to reading Deadly Harvest by Michael Stanley. Marie Moore has a 3 book deal with Camel Press- with her third, yet to be titled book, to be released in Spring 2014. She would like to call it Open Jaw ( a travel agent term- as her books are travel themed); but her agent is not partial to that title. Her first 2 books are Shore Excursion and Game Drive. Marie Moore likes to write books that are fun and cute- but that also have a deeper level, a level of knowledge for the reader. For example in Game Drive, she made sure to educate the readers about illegal hunting – animals are being killed for their tusks for the ivory. It’s an issue that Marie feels that people should be made aware of. If you are looking for fun books, cute mysteries and a main character that likes to solve mysteries- check out Marie Moore’s Sidney Marsh Murder series. I reviewed Game Drive several weeks ago as part of the Cozy Mystery Reviews Game Drive blog tour- to read my review, click HERE. I plan to read and review the first book, Shore Excursion, in the next few months.